"A swing and a miss." I don't see movement templates for huge ships in there, so either they are revamping that whole system, or. . . Range 5 ordnance is coming to Standard. The range template is multi-sectioned with a total of 5 interconnecting parts. 1 socket only, 4 socket and peg. Length of each section minus pegs = 1 range increment. Its a whiff, not much else, but the scent is there. My New Year's Eve party was a Second Edition (Team) Epic game. We (and by 'we' I mean 'I') wrote up a paragraph of house rules we could all agree on and threw down. For those interested, these house rules boil down to the following: Second edition upgrades only, with the addition of first edition cards that say "Huge Ship Only" or which interact with energy in some way. Initiative for huge ships = PS minus one, to a minimum of 1. Yes, Epic is not currently supported in XWM v2. This is only slightly less support than it had in first edition. While also appropriate given the quoted image... Contextually, he was using "whiff" to mean a hint of a smell. Nothing concrete, but enough to make one curious/suspicious. Not saying you weren't fully aware of that, but you know. nobody is broken up about fel, lol. no im talking about the $400 of ships FFG sold to many of us under the claim they were part of the game: the GR75, CR90, I.A.C., Raider, and C.R.O.C. I wasn’t inclined toward epic because the scale mismatches bug me. That said, I would be just fine with new epic releases as long as I don’t need to eBay pilots and upgrades to get the non-epic goodies from them. Going back to that would really piss me off. plus a few more in my area. Soon, Back it will be. I do my best to only read for content as I want it to be. I wasn’t inclined toward epic because the scale mismatches bug me. While I realize there is a large amount of sliding scale going on, once you get the ships on the table, it all feels pretty good. Ya know, gameplay >> fluff as they all say. You might not be broken up about fel. (Okay, none of us are, he was pack filler), but we are missing Carnor Jax, Tycho Celchu, Nera Dantels, Hobbie, etc. 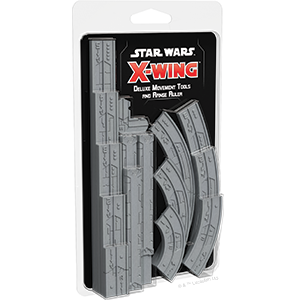 All I got to say is that it is about time FFG sold movement templates instead of just telling everyone that didn't get a tournament kit set to use the cardboard in the core set. I understand that every player is supposed to have a core set first and foremost but you are talking about components that can just get lost invalidating your entire purchase (now all they need to do is sell spare damage decks). I will admit that the aesthetic of this textured and rather thick looking templates (much like legion) is an odd choice for a range ruler set. If there were anything that defines as a misstep it would be on how they look. But if you want to define wiff... look no further than the squad builder app, of which yes FFG that does still need to be addressed. That would be nice. I'd like having a spare or two and it'd open up entry into the game a bit. 🤨 My use wasn't a batting reference, it was meant to imply scent. Like the faint hint of mint brush on the morning breeze. The range ruler extending out to range 5 when fully assembled implies that Epic 2.0 is still planned on being implemented. To me at least. I saw swing and a miss over there. As for range 5, that would be very forward thinking of FFG something that they have a spotty reputation on. If they didn't you could probably grab two more middle sections and make a range 5. But it is nice to know that the 5 different segments can be combined to one super large segment. Still I don't see any secondary weapons for standard ships going out past range 3 simply because the core set is at 4. Might be interesting to have a missile or something that has a longer range. I will admit that the aesthetic of this textured and rather thick looking templates (much like legion) is an odd choice for a range ruler set. I think a lot of it probably has to do with the plastic they're using. Acrylic can make long, thin shapes without problems, but this plastic is probably softer, and would fold or break if not properly thick enough. 100% yes. half the people I flew in first dont exist in 2nd, and none of my favorite upgrades made it in. I'm still waiting to see how I can get the Quick Build cards (that should have been in the conversion kits) without having to buy new copies of my existing ships. Also waiting for rules/conversions for my Epic ships. Also waiting to hear how I can buy more dials for all my 1.0 ships without having to buy another conversion kit to get cards I don't need and extra dials of the ships I only have a few of. Also still waiting on an App that isn't a total crock of $h*t.
FFG is seriously trying my patience here.